NSP Strategy: Can You Grant Verizon the Answer? Can You Grant Verizon the Answer? 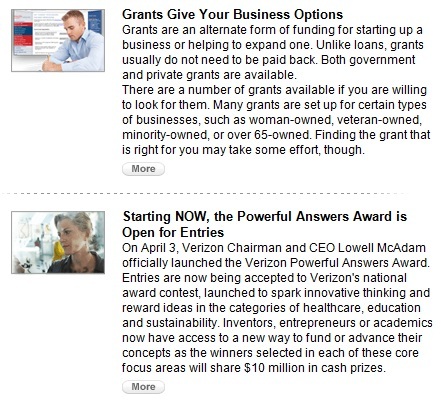 "Submissions are now open for Verizon's $10 million innovation award program. On April 3, 2013 Verizon Chairman and CEO Lowell McAdam officially launched the Verizon Powerful Answers Award, a national award contest designed to spark innovative thinking and reward ideas in the categories of healthcare, education and sustainability," according to VZ SMB News. So make some money with your innovation from VZ. The website is here. Another article in that newsletter pertained to Grants, all kinds of grants. My friend in Tampa helps companies get grant monies for training. There a number of sources for grants (see the article for links).